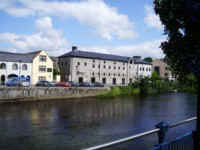 Yeats Language School established in June 2007, is situated in Sligo on the North West coast of Ireland. On the banks of the Garavogue River, it is a beautiful setting for a language learning experience. With a supportive management structure, teaching team and office staff, YLS can provide tuition for a range of courses from General English to English for Specific Purposes. The purpose built year round school provides high quality tuition for a diverse mix of students from all over the world. The Adult courses operate year round, while the International Junior School programme for students aged 12-17 years runs from June to August. The school also offers junior courses throughout the year in closed groups. Special Courses & Features: English for Business, English for Medical Professions, TOEFL Preparation Courses, English + Golf, English + Horse Riding (Equestrian), IELTS Preparation Courses, English for Au-pairs, High School Programme, Cambridge Examination Courses, One-to-One Instruction / Private Lessons, Courses for Juniors / Teenagers (12 - 16 yrs old), Recognised by the Department of Education and Science Education, Ireland to teach English as a foreign language, MEI RELSA Ireland and ACELS. Yeats Language School works primarily with host families. YLS students are provided with a friendly family atmosphere in a host family accommodation. They are well looked after and treated as a member of the family during their stay. Families provide students with a setting which enhances their language skills as they are completely immersed in an English speaking environment.